Fantasy “Felipe V” Spanish Suited pack based on popular models, anonymous manufacturer, c.1760. The pack contains 52 cards; unusual in that it has numeral cards up to 10, plus ‘Sotas’, ‘Caballos’ and ‘Reyes’. 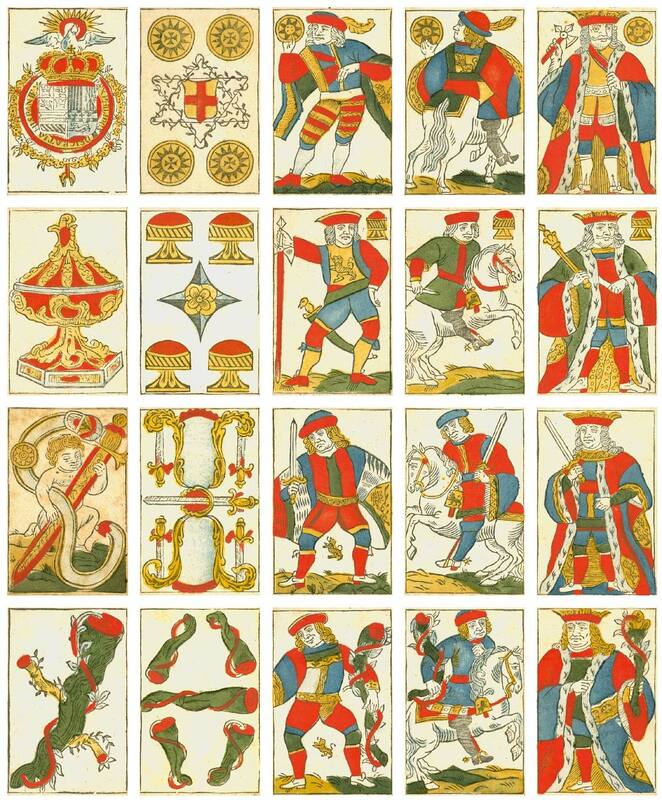 The original version of this deck, dedicated to Philip V on the ace of coins, is the work of the Sarton Bros & Sisters of Brussels (active 1745-67), whose name appeared on the banner of the ace and five of swords. Obviously destined for Spanish markets, the deck consists of a strange mixture of models where the presence of a lion stands out in all the figures, and the king of clubs holds the classic pharmaceutical symbol. The absence of ‘pintas’ (border breaks) and the unusual number of 52 cards underscore the rarity of a deck of obvious Nordic iconography; while the mock Latin inscriptions on the ace and five of coins are amusing nonsense. Above: Fantasy “Felipe V” deck, based on popular models, of 52 cards. Engraved in woodcut and coloured by stenciling, c. 1760. Unknown manufacturer. In Europe, especially in Belgium, decks were manufactured with Spanish design for export to the immense Spanish-speaking overseas market, or even by order of the Spanish manufacturers themselves. Thanks to Alberto Pérez González for images and additional research.